15 spaces or less per line is best. Engraving on the Paw Print medal is 7 cents per character. Engraving cost will be emailed after your order has been processed. Date you need your Paw Print Medal. 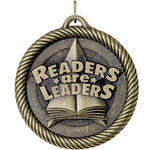 A 2" Readers are Leaders Medal that is available in gold only. The VM-292 reading medal with star design is an inexpensive school medal and may be purchased with or without a ribbon. If you would like your reading medal engraved the cost is 7 cents per character. Please fill out the text boxes below. You may have 4 small lines of engraving. Engraving cost will be emailed to you after your order has been processed. Purchase more and save more, discounts on purchases of 12, 50, 100 and 250 scholastic medals. The Readers are Leaders medals have various options. Your medal will come with a 7/8 x 30 inch neck ribbon by default, if no ribbon is need you must select that option, you may also select a wider neck ribbon 1 ½ x 30 or a pin drape ribbon. Another option is the 31 inch neck chain. The default color is red-white-blue, if you want a different color please select from our large selection on the left side bar. Most reading medals are shipped in 5 to 7 working days. We offer rush service, it is an additional 15% if we have the medals in stock. We have UPS next day, 2nd day and 3 day select shipping if needed. RUSH and Special Shipping should be confirmed by phone 1-800-787-8777.